January 22nd 2004. Chinese New Year - the Year of the Monkey. The Chinese Lunar New Year dates from 2600 BC, when Emperor Huang Ti introduced the first cycle of the zodiac. The Chinese lunar calendar is a yearly one, with the start of the lunar year being based on the cycles of the moon. Because this cycle fluctuates, the beginning of the year can fall anywhere between late January and the middle of February. In 2004, the Lunar New Year falls on January 22nd. People born in the Year of the Monkey are usually very successful. They are very ambitious, and if they cannot get started immediately, they become discouraged and sometimes abandon projects. Good at making decisions, they tend to look down on others. They have a deep desire for knowledge and have excellent memories. They are strong willed but their anger cools quickly. Famous people born in the Year of the Monkey include: Lord Byron, Julius Caesar, George Lucas, Omar Sharif, Elizabeth Taylor, Harry S. Truman & Leonardo da Vinci. 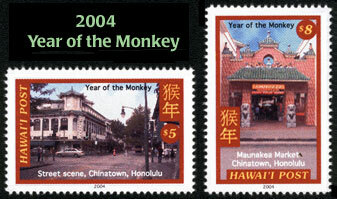 Two stamps were issued on February 12th 2002 to celebrate the Year of the Monkey. They depict two different views of Chinatown, Honolulu. Unlike many other stamp-issuing entities, Hawai'i has a substantial percentage of the population who are of Chinese descent. Consequently, Chinatown in Honolulu is much larger compared to many other cities on the mainland. The $5 stamp (above left) prepays the Overnight rate. It shows a modern street scene in Chinatown, Honolulu. The $8 stamp (above right) prepays the Same Day rate. It shows the entrance to the Maunakea Marketplace, Chinatown, Honolulu. Both stamps are from current photographs taken recently. The postmark for this issue is shown above. Click here to order stamps. Printer: Hawai'i Security Printers, Honolulu, Hawai'i. Printing Method: 4-color (Cyan, Magenta, Yellow and Black) printing process. Paper: GPA coated white stock with water-activated gum on the back.